Suppose a child asks a grown up their age. The grown up replies “I’m not telling you, but if I live for another 72 years then I’ll be 100”. The age of the grown up is still ‘unknown’ but there is enough information to figure it out. Because we know that we can figure out that the grown up is 28 years old. Now suppose you ask my childrens’ ages. I have two children. I reply “I’m not telling you but if you add their ages together you get 10, and they are 4 years apart”. The ages are still ‘unknown’ but because there are two different facts about the two ages, it is possible to figure them out. The answer is as and . Their ages add up to 10. That leads us to the equation , (or ). They are 4 years apart. That leads us to the equation , (or ). This unit is about how to find the values of two unknowns when we have two equations about them. Notice that because the point lies on both lines, it is the point of intersection of the two lines. 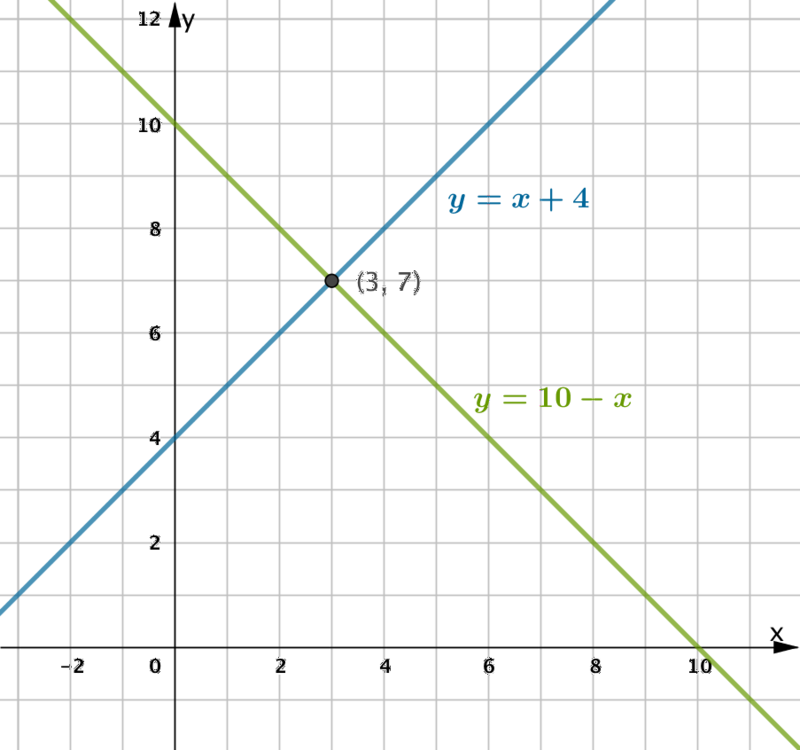 Finding the solution to two equations in two unknowns boils down to finding the point where the two graphs intersect. 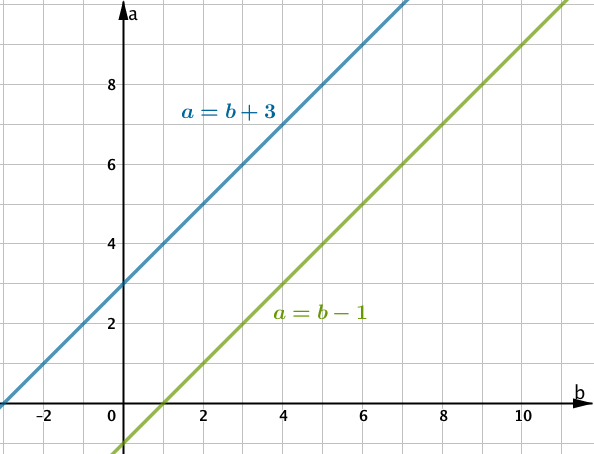 If graphing is not efficient, an algebraic approach can be used. Which ordered pair satisfies both equations? Use mental arithmetic to determine which one of the three points lies on both lines. When two expressions are equivalent, all ordered pairs will satisfy both equations. The expression on the right is just a rearrangment of the expression on the left. Notice that all of those ordered pairs also satisfy . If one equation can be rearranged to the other, the equations are equivalent. All ordered pairs satisfying one equation will also satisfy the other. If our set of equations leads to two lines that are parallel but not coincident, then there is no ordered pair that will satisfy both relations. Desmos Activities: Go to student.desmos.com, ask for the class code.